Harness the power of the platform with the single most efficient way to drive hotel business for your agency. Hotel Retail transforms labor intensive tasks into expert agent proficiency. Travel agents no longer need to rely on websites and mapping applications to locate the most relevant hotel with the best rates for their customers. Hotel Retail has a simple to use, efficient design. 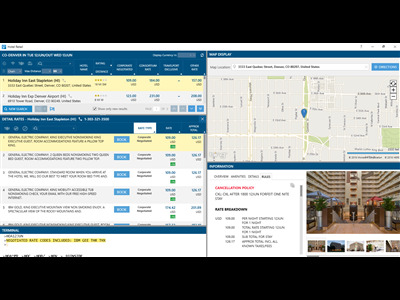 Functions include the ability to quickly change the sort order, compare rates, and an interactive map with search capabilities that ensures agents can respond to customers’ requests all without leaving their workflow. Travelport Exclusive rates are automatically displayed to ensure agents can provide the best choice for their customers.